"You ca'n't think how glad I am to see you again, you dear old thing!" said the Duchess, as she tucked her arm affectionately into Alice's, and they walked off together. She had quite forgotten the Duchess by this time, and was a little startled when she heard her voice cose to her ear. "You're thinking about something, my dear, and that makes you forget to talk. I ca'n't tell you just now what the moral2 of that is, but I shall remember it in a bit." Alice did not much like her keeping so close to her: first, because the Duchess was very ugly; and secondly, because she was exactly the right height to rest her chin on Alice's shoulder, and it was an uncomfortably sharp chin.4 However, she did not like to be rude5: so she bore it as well as she could. "The game's going rather better now," she said, by way of keeping up the conversation a little. "'Tis so," said the Duchess: "and the moral of that is  'Oh, 'tis love, 'tis love, that makes the world go round!" "Ah, well! It means much the same thing," said the Duchess, digging her sharp little chin into Alice's shoulder as she added "and the moral of that is  'Take care of the sense, and the sounds will take care of themselves.'" "I dare say you're wondering why I don't put my arm around your waist,6" the Duchess said, after a pause: "the reason is, that I'm doubtful about the temper of your flamingo. Shall I try the experiment?" "Very true," said the Duchess: "flamingoes and mustard both bite.7 And the moral of that is  'Birds of a feather flock together.'" "It's a mineral8, I think," said Alice. "Of course it is," said the Duchess, who seemed ready to agree to everything that Alice said: "there's a large mustard-mine9 near here. And the moral of that is  'The more there is of mine, the less there is of yours.'" "Oh, I know!" exclaimed Alice, who had not attended to this last remark. "It's a vegetable. It doesn't look like one, but it is." "I think I should understand that better," Alice said very politely, "if I had it written down: but I ca'n't quite follow it as you say it." "A cheap sort of present!" thought Alice. "I'm glad people don't give birthday-presents like that!" But she did not venture to say it out loud. "Just about as much right," said the Duchess, "as pigs have to fly;12 and the m "
But here, to Alice's great surprise, the Duchess's voice died away, even in the midddle of her favourite word "moral," and the arm that was linked into hers began to tremble. Alice looked up13, and there stood the Queen in front of them, with her arms folded, frowning like a thunderstorm. The Duchess14 took her choice, and was gone in a moment. Then the Queen left off, quite out of breath, and said to Alice "Have you seen the Mock Turtle yet?" "It's the thing Mock Turtle Soup16 is made from," said the Queen. They very soon came upon a Gryphon17, lying fast asleep in the sun. (If you don't know what a Gryphon is, look at the picture.) "Up, lazy thing!" said the Queen, "and take this young lady to see the Mock Turtle, and to hear his history. 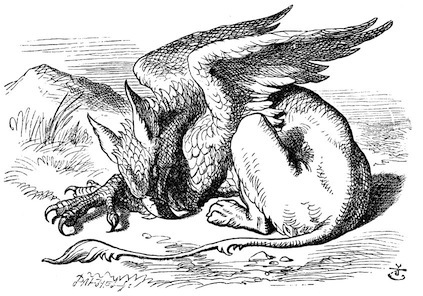 I must go back and see after some executions I have ordered;" and she walked off, leaving Alice alone with the Gryphon. Alice did not quite like the look of the creature, but on the whole she thought it would be quite as safe to stay with it as to go after that savage Queen: so she waited. The Gryphon sat up and rubbed its eyes: then it watched the Queen till she was out of sight: then it chuckled. "What fun!" said the Gryphon, half to itself, half to Alice. They had not gone far before they saw th Mock Turtle in the distance, sitting sad and lonely on a little ledge of rock, and, as they came nearer, Alice could hear him sighing as if his heart would break. She pitied him deeply. "What is his sorrow?" she asked the Gryphon. And the Gryphon answered, very nearly in the same words as before, "It's all his fancy, that: he hasn't got no sorrow, you know. Come on!" So they went up to the Mock Turtle, who looked at them with large eyes full of tears,20 but said nothing. These words were followed by a very long silence, broken only by an occasional exclamation of "Hjckrrh! "22 from the Gryphon, and the constant heavy sobbing of the Mock Turtle. Alice was very nearly getting up and saying "Thank you, Sir, for your interesting story," but she could not help thinking there must be more to come, so she sat still and said nothing. "When we were little," the Mock Turtle went on at last, more calmly, though still sobbing a little now and then, "we went to school23 in the sea. The master was an old Turtle  we used to call him Tortoise "
"Why did you call him Tortoise,24 if he wasn't one?" Alice asked. "Yes, we went to school in the sea, though you mayn't believe it "
"We had the best of educations  in fact, we went to school every day "
"I've been to day-school,27 too," said Alice. "You needn't be so proud as all that." "Yes," said Alice: "we learned French and Music." "And washing28?" said the Mock Turtle. "Ah! Then yours wasn't a really good school," said the Mock Turtle in a tone of great relief.29 "Now, at ours, they had, at the end of the bill, 'French, music, and washing  extra." "You couldn't have wanted it much," said Alice; living at the bottom of the sea." "I couldn't afford to learn it," said the Mock Turtle, with a sigh. "I only took the regular course." "Reeling30 and Writhing31, of course, to begin with," the Mock Turtle replied: "and then the different branches of Arithmetic32  Ambition,33 Distraction34, Uglification35, and Derision36." The Gryphon lifted up both its paws37 in surprise. "Never heard of ugliifying!" it exclaimed. "You know what to beautify is, I suppose?" "Well, there was Mystery,40" the Mock Turtle replied, counting off the subjects on his flappers,  "Mystery, ancient and modern, with Seaography41: then Drawling42  the Drawling-master was an old conger-eel,43 that used to come once a week: he taught us Drawling, Stretching44, and Fainting on Coils45." "Well, I ca'n't show it you, myself," the Mock Turtle said: "I'm too stiff. And the Gryphon never learnt it." "I never went to him," the Mock Turtle said with a sigh. "He taught Laughing46 and Grief47, they used to say." This was quite a new idea to Alice, and she thought it over a little before she made her next remark48. "Then the eleventh day must have been a holiday?" This isn't such a new rule at all, in fact it is the 'law of signatures' where the appearance, taste, or feel of a substance was supposed to indicate its potential effects on the human body and mind. It strongly suggests what was probably not considered a 'law of physik', that is medicine, so much as an excellent mnemonic for health professionals. However, multiple attempts to control the dissemination of knowledge, the most well known one in europe being the dark ages, often broke the tie between reasoning and evidence and the ultimate principles and laws that were developed from them, so that causes, effects, and even the original purpose of a rule could be lost. A 'moral' being a pithy statement of the lesson behind the story, or else the fixed precepts that a person lives by, specifically those that mean the person in question is good and honest. Humans do seem to have some broadly agreed on morals, the trouble being that each of them has a loophole. A rather famous set of examples are the 'Ten Commandmants' which heedless of which version you read (there are at least two in the christian bible I am most familiar with and they are not identical), they are not an internally consistent system. Plato is particularly famous for his dialogues (as a rule they are only just about that, but I digress) that discuss what being good is, and how to be good consistently and to hold a view of being good such that you can't easily let yourself off the hook whenever it suits you. It's easy to agree that not every statement need have a moral, implied or otherwise. If we replace 'moral' with 'meaning', a term that is used occasionally as a synonym for 'moral' even though it isn't, it isn't long before we find ourselves in trouble. Not every statement has a meaning, and any statement that seems to be meaningful need not be meaningful any time it is used. In fact, a meaningful statement inserted at the wrong time can be quite disturbing. This constitutes a whole other area of philosophy, and at least according to the book Monty Python and Philosophy the doyen of the study of meaning in language was Ludwig Wittgenstein. I have no opinion on that score, though it sounds like he'd be great fun to read, much more so than Martin Heidigger. In some ways Alice's reaction is a bit puzzling. Thankfully physical ugliness is not catching, unless it is the side effect of having a disease. That said, it is quite reasonable to want to keep someone who makes you uncomfortable at arm's length or better away, let alone keep their mouth some distance from your face. The Duchess is taking serious liberties here. She and Alice are certainly acquaintances, but they are not friends, so this sort of physical proximity is rude. The paradox being that to enforce a reasonable distance between them, Alice would have to be rude, putting her at further disadvantage in the encounter. Today this would be the point where a person would be protesting pointedly and enforcing that personal distance bubble. Mustard does indeed have bite, although not the toothy or kind  and since flamingoes are birds, they don't either. Mustard being in fact the whole or crushed seeds from plants in the cabbage family. It experienced a remarkable vogue in canada a few years ago, suddenly exploding from a small selection of yellow pastes to colours ranging from yellow through brown to something like black, grain mustards, honey mustards, and spicey mustards. The warning sign of a new trend were, of course, television commercials for a 'dijon mustard' with a snooty reputation. The process of crushing the seeds is likely the lateral connection to minerals, as unless a mineral occurs in lone chunks or crystals, it must be broken out of ore by crushing. Unfortunately, there is such a thing as a mustard mine, that being a type of land mine used to disseminate mustard gas. 'Mustard' in this case appears to relate to the colour of the gas, which is rendered yellow by its sulfur content. Mustard gas is vile stuff, causing terrible chemical burns at very low levels that may not appear immediately. Honestly, the second version of the sentence is practically speaking, nonsense. Yet the first version isn't necessarily much better. 'Be what you seem to be' to who? The trouble with what you 'seem' to be is that your appearance need not correspond to it. There's a whole genre of gothic novels written in the 1800s that deal with that theme. On the other, there is keeping up a certain appearance due to a social role that may or may not have been chosen, while potentially acting completely otherwise when out of the public eye. Which is not to say it wouldn't be preferable to simply be, and appear as yourself. Another philosophical conundrum. A reasonable comment, contrary to the Duchess' next statement, even if only because it is no easy thing to control what people think, or stop thinking. Various attempts to control thought have been made, usually by totalitarian organizations ranging from secular governments to religious hierarchies. The strongest focus of those efforts tends to be on what is written and said aloud. Luckily for us, no one has yet found a way to prevent the control effort from becoming so leaky as to be ludicrous. Unfortunately, more than one female person has heard this declaration in real life to this day, pigs flying being impossible, of course. In the victorian period especially, women in england were still actively fighting for their freedom to think and pursue academic learning. The Queen has grown again, apparently. 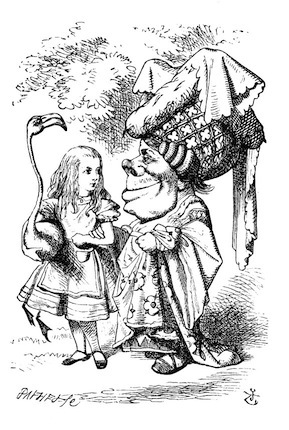 Tenniel illustrates the Queen of Hearts as a caricature of Queen Victoria. Ironically, the law was changed before Queen Victoria took the throne removing her powers to commute the death sentence of a criminal. Apparently the parliament decided she would be pardoning all and sundry, quite ironic considering that practically speaking the last english queen was in fact unbelievably bloody. Elizabeth I dawdled over signing her sister's death warrant for many reasons, not the least of which not wanting to establish a precedent for execution of monarchs. However, this didn't make her nice. She had no issue with the genocide perpetrated on the irish, or the growing genocide in the americas, supporting them fully. A curious feature of the Duchess in Tenniel's illustration is that she doesn't seem to have much of a neck, related to her rather appalling facial structure. Practically speaking, in the medievalish period these peculiar characters seem to inhabit, women probably would have had thoroughly covered necks once they were old enough to be considered adults. Ruffles and other elaborate collars were highly fashionable, and stretched an alarming distance up the neck. The Queen appears to be determined to win by default; having sentenced most of the players to death and chased off the Duchess, she is now going to send Alice off somewhere else. Presumably the King will defer the game to her! All that said, it is remarkable that Carroll describes the Queen as quarrelling with the other players. A quarrel generally takes at least two people to actively take part, but it is no easy thing to quarrel with someone who can simply sentence you to death. There really is such a thing as 'mock turtle soup.' Turtle is a rather expensive foodstuff, so its mock form was developed as an economical means to seem to eat as the rich do, a middle class interest. The soup is a sort of heavy broth with beef bits and usually a garnishing of balls of suet done up with a coating to hold them together. It sounds like an appalling dish, but would have been hot and filling on a cold, wet day of hard work. Gryphons are better known nowadays thanks to Harry Potter by the alternate and now more common spelling 'griffin.' They are ancient mythical beasts, hawk-headed and lion bodied, revered and popular in decoration throughout the southern mediterranean and eastern anatolia. Some of the most famous and fine examples of decorative gryphons are from minoan and mykenaean sites, typically associated with royalty. They are less recognisable in European heraldry, having been superseded for the most part by the lion by the medieval period. Given what I noted earlier about the law change when Victoria was about to come to the throne, it is fabulous irony that Carroll has the King pardon all the hapless croquet people. But to return to the Gryphon, there's plenty of irony to be mined here. In the previous note the gryphon's ties to royalty and heraldry, and here we have a character evidently intended to be a sort of lower class, uncouth figure, though it has had a chance to attend a good school, as we'll see shortly. In many ways, this is truly the small child's lament. It can seem like everybody can tell you what to do and you can't say no when you're a child, especially between the ages of five and ten. What adds particular insult to injury in the class-conscious Alice's case is that the order is coming from a figure whose accent is a give-away for a lower income. The presumed ties between accent and class are the pivotal factors in plays like 'My Fair Lady' by George Bernard Shaw, featuring doughty Eliza Doolittle and execrable Henry Higgins. The Mock Turtle would be piteous indeed if you met him in real life; large, tear filled eyes seem to be something we're genetically programmed to respond strongly to. Just why the Mock Turtle is so upset as to weep forever by the edge of the sea like a sort of ersatz Heliade  one of the nymphs who supposedly weep tears of amber on the shores of the Baltic Sea in mourning for Phaethon, a Greek falling star figure  is not entirely clear. Perhaps he's simply upset because he isn't a real turtle any longer. The picture of him shows a curious amalgam of what looks like a calf's head and pig's trotters on a sea turtle body. Neither Alice nor the Gryphon follows this directive, no surprise in light of the events in the earlier Caucus Race. Practically speaking, in real life if a person were truly to stay silent throughout a companion's speech, this would go over very badly. Without the occasional noise indicating you're listening, or even a clarifying question or two, your companion will most certainly become offended and upset unless they are talking about a topic that inspires them with deep enthusiasm. The exclamation at least looks more like an onomatopoetic rendering of a hiccup, usually spelled 'hiccough' in british english. Hiccups are diaphragm spasms, often started by eating too fast or excessive belching. Several on-line medical sources connect hiccups with indigestion, though how true this might be is not clear. Hiccups rarely last long, although there are occasional cases where other medical issues may cause them to last for days or even years in especially rare cases. The happy coincidence of the two meanings of school, a group of fish and a place children are sent to learn to read and write, is surprisingly old, and an accident. The reference to a place to learn comes from the Greek term for a lecture and free time, a correlation made because the rich were the only ones who could afford a formal education. The word referring to a group of fish that swim together may come from old english scolu, or even from a cognate word in middle dutch, scole that could also be used for a group of other animals than fish. 'Tortoise' is a term usually applied to herbivorous land turtles  at least in canadian and british dialects of english. As Richard Dawkins has commented, turtle terminology in english is a mess (this from Dawkins before he found Twitter and began displaying opinions that were better kept to himself). Aquatic turtles may or may not be herbivorous, and live in fresh or salt water. 'Tortoise' is a mangling of the French word for 'turtle', tortue. The most obvious pun on the word 'tortoise' here is a charming one, but there is a less obvious one that is a bit more grim. It also has a resemblance to 'torture', and as anyone who has suffered a long, tedious, miserable class knows what it is to be tortured by boredom. However, boredom was sometimes the least of your worries in british boarding schools, where corporal punishment by teachers and hazing by students could leave a student with serious scars of both the physical and mental kind. Lewis Carroll's experience of his boy's school was not a happy one, and he must have been delighted to find oxford so congenial. Earth swallowing motifs are surprisingly common considering how rare the literal experience must be. Sources as diverse as greek myths and documentaries sometimes invoke it as a divine punishment for the wicked, other times as a divine act of assistance for the desperate, usually someone fleeing an inescapaable pursuer. It is quite interesting that at least in the various cultures tied together by the english, sinking to the earth is the hoped for escape from an inescapable gaze. This is quite consistent with the remarkable obsession of those cultures with appearance as expressed by the cult of celebrity. Another of Carroll's cretan-liar style quips here; until Alice spoke she hadn't said she didn't believe the Mock Turtle, yet in her speech she literally says the words even though she is negating them. The cretan liar paradox is well-known, although it is rendered into many other forms that hide its origins. The original sequence runs roughly as follows: "All Cretans are liars. The person saying this is a Cretan." 'Day-school' seems a curious reference from the perspective of most north americans today. The modified term is necessary because boarding schools were the usual mode of schooling after a child, usually a boy, had learned the basics of the so-called 'three R's', reading, writing, and arithmetic. The 'three R's' were learned at home or at day-school. The anxious status picking that follows could be seen as a reflection of the discomfort experienced by men who had grown up in an education system closed to women that was being replaced by a relatively more liberal system. It is a sadly ironic twist that many little girls did wind up learning 'washing' in school, often in the guise of 'religious education' and later via the assinine construct of 'home economics class.' Today due to liability issues home-ec tends to be pushed forward to junior or even senior high school, where the focus is still a 50s style curriculum of sewing, cleaning, and cooking. A 'good school', one geared to prepare upper class boys for expensive boarding schools and later university would include ancient greek and latin as part of their standard curricula, as these were typically entrance requirements to university. A good 'finishing school' for girls would include music instruction as part of preparing the girl to be a good wife and entertainer of guests. 'Reeling' standing in for 'reading,' of course. Fish reels aside, considering the lobster quadrille that comes up in the next chapter, this is probably a dancing reference to the famous scottish and irish reels. Admittedly, they are less famous compared to irish clog dancing currently. 'Writhing' for 'writing'  if there were such subjects, and they didn't involve literal use of pain to create the writhing, a graduate would presumably be very lithe and strong indeed. It could be argued that pilates is a form of slow and carefully modified writhing, however. Etymologically, 'arithmetic' refers specifically to the skill of counting, and it currently constitutes one of the most abused pseudo-subjects in a typical 'western' school. Thanks to hours of tedious and awful drills in simple calaculations so that they become rote, most students are put off of mathematics, which is far more interesting, for the rest of their lives, rendering mathematics assignments and tests sheer torture until at last they can avoid any more maths instruction. All of which is not to deny that arithmetic is a basic building block of mathematics  of course it is, and the rest of the subject can't make any sense without it. The trouble is that the usual methods of teaching arithmetic provide students with bridges into more complex concepts almost by accident. An examination of just how arithmetic bridges into more complex areas of mathematics is provided by Where Mathematics Comes From by Lakoff and Nuñez. The text can be tough going in places, but is well worth the effort. 'Ambition' does more than rhyme with addition; to be ambitious is to want to seek success and to act accordingly. The word came into english in company with 'candidate' from the institution of latin elections during the roman republic. A citizen indicated to all and sundry that he was running for office by speechifying, chalking up graffiti urging people to vote for him, and wearing a whitened toga. The latin word for white is candidus. The candidate had to walk around to give his speeches and do the ancient roman equivalent of kissing babies and cutting ribbons, which was described by the Latin term ambire (literally "to walk around"), from which ambition is derived. Distraction for subtraction, again with a neat metaphorical tie between the two. To be distracted is to have your attention taken away from what you should be dealing with to something else. Distraction is a favourite tactic of politicians and parlour magicians, both of whom like it best when we aren't watching their hands. 'Uglification' is a practice currently endemic to north american cities, especially newer cities like calgary and vancouver. According to some authors, uglification is a part of the active contest in england to design and build the ugliest building ever. My recommendation would be to reserve judgement on that until you've had a look at some of the recent emissions in calgary, especially the city hall. Derision is to mock and tease someone, usually so as to humiliate them. 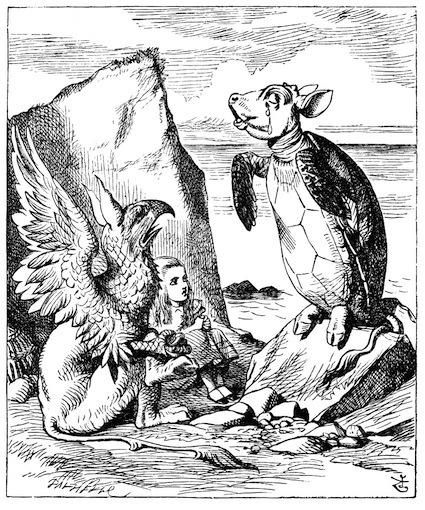 Alice has had a dose of derision a few paragraphs ago, so it seems the Mock Turtle and the Gryphon alike took in their derision lessons well. Division is one of the most unpleasant mathematical skills to learn, not least because the method of teaching it seems to traditionally start with memorization of the inverses of the multiplication table using the dot and lines division symbol. Then a child is faced with 'long division,' an exercise in sheer torture insisted on apparently because this is believed to be the only way a child can really 'know' how to divide. It wouldn't surprise me to learn that children figure out short division very quickly to save themselves some work, especially once they have learned some estimation skills. Tenniel apparently didn't read this section, or ignored it, which would be fair enough. The illustration shows the Gryphon with an alarming set of eagle's claws on its forelimbs rather than lion's paws. In any case, this makes it clear that the Gryphon walks upright rather than on all fours. 'Beautification' is a common excuse for a whole range of activities that rarely seem to make things 'prettier.' Famous beautification projects include ripping out old and healthy trees and bushes on university campuses, re-siding houses with vinyl, and replacing basement wall coverings with shag carpet. More often than not, 'beautification' seems to correspond to an almost pathological desire to destroy anything more than twenty years old, especially in the category of buildings. The phenomenon may be an especially north american one, where there is an apparent practical belief that memory is encoded in objects, and therefore the past can be destroyed and prevented from affecting the future by destroying what is old. When I attended elementary school, there were eight subjects students were had to take all together, including such strange amalgams as language arts and 'phys-ed.' We did indeed have music class, although wisely the recorder had long been dropped. Instead, we were expected to learn how to sing, usually rounds and call and response songs. Later, in junior high school, 'music' was transmogrified into 'band class,' a strange exercise in being relegated to learn an instrument you weren't interested in playing while being subjected to the insufferable behaviour of those who were taking extensive musical instruction outside of school because their parents could afford it. I have never forgotten the results when three students were told they had to play "easier" instruments than the french horns and flute they had selected to learn. From that day forth they either skipped or made continuous nuisances of themselves in the class. Perhaps working with the "harder" instruments would have led to the same result, but I can't hep but doubt it. If you go to school in the sea, you will certainly take seaography as opposed to geography. By analogy, seaography should refer to the study of the physical features of the ocean and the locations of important features in it, perhaps stable currents, underwater atolls and the like. The first encounter most students have with geography is via map exercises. Contrary to the declarations of the crew in The Hunting of the Snark, maps of the ocean would not be blank even if you started in what the program writers at Apple used to define as 'the Middle of Nowhere', a spot somewhere in the midst of the atlantic ocean. 'Drawling' is generally defined in exclusively in negative terms as a lazy, slow form of speech that emphasizes vowels. Practically speaking to drawl something you would have to be lengthening the vowels since consonants are mainly produced by stopping the flow of air past the vocal cords, which means no noise. (Exceptions include the fricatives and sibilants, but when we draw out those sounds it's called a hiss.) Shouting across noise or distance tends to involve the same features, lengthened vowels and slowed speech, so it seems another key marker of drawling is not speaking above a level tone of voice. Conger eels are edible, and can be alarmingly big if you are the usual human average height of 1.8 metres or so. Conger eels can be up to 3 metres long. If you have eaten sushi and gone beyond the most commonplace items (usually made with shrimp, lobster, tuna, or salmon), you have probably eaten some eel, which can taste surprisingly sweet. 'Stretch' is one of the busier words in english, with a range of applications as a noun, a verb, and an adjective. Metaphorically it lends itself especially to describing a length of time or even a length of road, although the latter use seems less common. It is rare today to see a real 'stretcher' in the 'flesh', the original device used to carry an injured person to hospital. The original device was basically a piece of cloth attached to two poles, and for my part I have only seen them in war movies. 'Fainting on Coils' sounds about as easy as 'Painting in Oils' can be, suggesting a scene that would fit in The Hunting of the Snark. It seems an act especially suited to the Baker, a rather timorous character until his penultimate act in the poem. Alas, if you learned latin via reading the self-serving, nonetheless gruesome and psychotic memoirs of Julius Caesar, it was no laughing matter. The majority of the latin comedies surviving to the present were written by authors rewriting greek plays either as a translation or using the basic elements of plot and character. The romans are infamous for their general lack of artistic creativity, but it remains an open question whether this is a fair characterization. Certainly what has come down in writing is mainly derivative of greek works, yet that corpus is lamentably small and may not reflect works being created by authors without elite patrons. Several cycles of tragic plays survive in ancient greek, apparently based on several widely known and elaborated stories. They include the stories of Troy, the Heraclids, and the seven against Thebes. In general, as the label 'tragedy' suggests, basically everybody is hideously doomed due to either their own foul characters or a curse cast on their family heedless of their own actions. Yet, the versions presented in the plays that have survived are not the only ones. A number of other versions were preserved by greek writers ranging from historians to gazeteers to still other playwrights, as well as on pottery and carvings. 'Lesson' is another borrowing into english from french. French derives the word from a latin word referring to a thing read, probably out loud considering the term first designated a passage read out loud from the christian bible. The pun allowed by the homophone 'lessen' is a happy one, and no doubt children and adults alike have dearly wished that 'lessons' would do just that from time to time. Things get cut short just in time to avoid negative numbers, which tend to bamboozle readers of the age Alice In Wonderland is directed towards. For those familiar with the judaeo-christian genesis story featuring the world being created in six days with the seventh day being the one the Creator rests on, this suggests that the days of the week could be properly labelled from 0 to 6. Such numbering would please many computer programmers!